When using Mac, you may need to record your Mac screen due to this or that reason. For some, you may have gained good skills in Mac screen recording, or at least, you may have some good suggestions for Apowersoft Mac Screen Recorder. Now we are collecting those simple tricks or suggestions that can help our users to improve their user experience. If you have something to share, just leave a message here, and you’ll get Apowersoft Mac Screen Recorder VIP for FREE! Way 1. Anyone who leaves a message here can get a Yearly VIP Account for Mac Screen Recorder. You can share your experience of using Mac screen recorder, your tricks on how to record Mac screen in a better way, or your suggestions about Mac screen recorder, etc. All these will impel us to go forward. Way 2. Share Apowersoft Mac Screen Recorder to Facebook and like us, and then you can get a Yearly VIP Account for Mac Screen Recorder. Once done, please send the screenshot to us here or email it to us at support@apowersoft.com. I use Apowersoft Mac Screen Recorder to record online class on my Mac so that I can review it after class and share the recorded contents with my friends. The reason why I choose it was that I can set hotkeys to start or stop recording easily by using it, and it also allows to set recording schedules to record the classes so I don’t have to be sitting in front of the Mac by myself, which I think is really convenient. Now, please send me the VIP. Thanks. Thanks for your sharing! We have activated your registered email as the VIP account for using Apowersoft Mac Screen Recorder. Please check your email box to find the login information. Apowersoft Mac Screen Recorder is very easy to use! I usually use it to record tutorials and upload them to YouTube. I really appreciate it if you can offer me the VIP! Thank you for your support! We have already renewed your email account as VIP. Please log in Mac Screen Recorder using the email address you logged in the forum to fully activate it. ApowerREC is definitely excellent for quick screen recording, which i can use to record live stream and share them right on my Mac . I wish it will also include some basic editing tools in future updates. Keep moving! Thank you for your support! Your suggestion has been submitted to our technical department, they'll decide whether this feature will be added or not. Also, your VIP for Mac ApowerREC has been activated already, please log in by using your email account to fully activate it. Thank you for your sharing. We have made some improvements in the latest version of the screen recorder - ApowerREC. You can also try it out. Your VIP has been activated already, please use your email account to log in and activate it. I love Apowersoft Mac Screen Recorder, it allows me to record my game processing on Mac, it can record audio with video. And then, I can share it with my friends. High quality, clear and fluent. My friends also like this program. Thx Apowersoft! Thank you very much for your sharing. Your yearly VIP for Mac Screen Recorder has been activated already, please use your email account to log in and activate it. I used QuickTime for recording screen, it worked, but one downside is that it’s not convenient enough for recording fixed region since it does not allow me to enter in a certain number of the recording size. Therefore I searched in Google and found the Apowersoft program, it’s exactly what I am looking for. Hope you guys can offer me a free VIP for using. Thx. Thanks for sharing. Your yearly VIP for Mac Screen Recorder has been activated already, please use your email account to log in and activate it. Hope you enjoy using it. Olá, Tenho usado desde maio/2017 o Gravador de Tela para meus trabalhos. Cursos e vídeo sobre comportamento organizacional. Sempre que preciso explanar em videos algo mais didático minha ferramenta insubstituível é sem dúvida o Gravador de Tela da Apowersoft. Isto tudo pelo simples fato da facilidade que o usuário encontra para efetuar um bom trabalho. Não consigo me ver fazendo um vídeo sem usar esta ferramenta. Meus sinceros agradecimento a toda equipe de suporte e parabenizo também a equipe de desenvolvimento. Thank you very much for your sharing. Your yearly VIP for Mac Screen Recorder has been activated already, please use your email account to log in and activate it. If you have already logged in, please restart the program to update your account info. 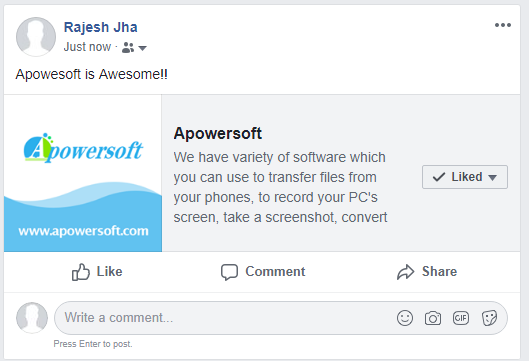 Apowersoft is the best screen recorder software I ever used for the trial 3 days – Please send me the VIP account information would highly appreciate it.. I have shared it on my FB Page too.. Thank you for your sharing and sorry for the late response. Your yearly VIP has been activated already, please use your email account to log in and activate it. Hope you enjoy Apowersoft product! Thank you very much for your sharing and sorry for the late response. We've activated your yearly VIP account already and sent an email to you, please check it. Now you can use your email account to log in and activate it. Hope you enjoy Apowersoft product! I am screen recording more and more as my suite of courses grows AND this product is matching up nicely. Simple, and easy to get going on. I like what I see. However, either I haven’t found it or it isn’t yet a feature but I like the ability to set the screen record size to an app window with one click without having to drag cursors. Thank you very much for your sharing and sorry for the late response. We've activated your yearly VIP account already and sent an email to you, please check it. Now you can use your email account to log in and activate it. We'll keep improving our products! I was looking for screen recorder software and one day I found apowersoft screen recorder and its very awesome software. But in previous version I found one issue which took a lot of space after saving video. I mean took 50mb space for 1 min video. Overall screen capturing result is mind blowing. I really happy to find this software. Thank you very much for your suggestions, and we'll keep improving our products. We've activated your yearly VIP account already and sent an email to you, please check it. Now you can use your email account to log in and activate it. Yes, our screen recorder allows you to record on a second screen while working on the primary desktop. To do it, simply drag the recording region to the screen that you wanna capture. Btw, we've activated yearly VIP account already and sent an email to you, please check it. Now you can use your email account to log in and activate it. Thanks for your love for our screen recorder. We have already activated a free yearly license for you and sent you an email. You can use your VIP email account to log in program and use it.